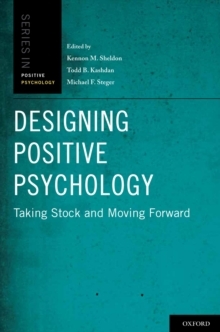 In the short time since the publication of the Handbook of Positive Psychology, research results on the psychology of human strengths have proliferated. However, no major volume has documented the methods and theory used to achieve these results. Oxford Handbook of Methods in Positive Psychology fills this need, providing a broad overview of diverse contemporary methods in positive psychology. With contributions from both leading scholars and promising young investigators, the handbook serves to illuminate and, at times, challenge traditional approaches. Incorporating multiple levels of analysis, from biology to culture, the contributors present state-of-the-art techniques, including those for estimating variability and change at the level of the individual, identifying reliability of measurements within and across individuals, and separating individual differences in growth fromaspects of phenomena that exhibit shorter-term variability over time. The volume covers such topics as wisdom, health, hope, resilience, religion, relationships, emotions, well-being, character strengths, and laughter. 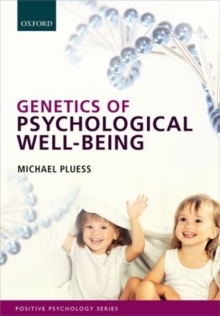 It enhances our understanding of the balance between human deficits and strengths anddemonstrated their connections to other problems. 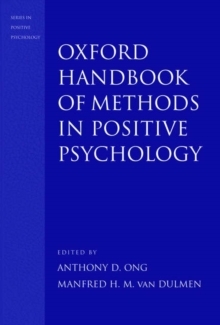 Oxford Handbook of Methods in Positive Psychology will be the essential reference for methods in positive psychology.